According to Pudge Forrester, AAA9GL, government liaison for Army MARS, Lieutenant General Susan Lawrence has reversed the decision to phase out the use of the WinLink 2000 global radio e-mail system by Army MARS members. General Lawrence stated that the Army, after reviewing its capabilities, had decided that the continued use of WinLink 2000 was a valuable asset to Army MARS members and agencies that were using the service. She issued a statement to that effect on December 21, 2011. On January 5, 2012, the Chief of Army MARS officially notified his membership that the phase out notice had been rescinded. Army MARS members and agencies who had been using the service hailed the decision by General Lawrence and resumed use of WinLink 2000. Do not forget to submit your 2011 annual reports to ARRL HQ. EC's may access form C "EC Annual Report" on the Public Service page. The form may be downloaded as a Word document. Once completed email it to ARRL Field Services Supervisor, Steve Ewald, WV1X, sewald@arrl.org or you may mail it to ARRL HQ, 225 Main St. Newington, CT 06111. Section Emergency Coordinators are reminded to submit their monthly SEC reports. This can be done online. "Go ahead Lilbert; this is Command." "Command, a civilian stopped by just now and notified us that some heavy smoke is visible south of County Road 343 within a mile of the Angelina River bridge. She says the smoke was not there earlier." "Roger, Lilbert. We will pass that information on. KD5GEN"
This was one of the QSOs between Rusty Sanders, KD5GEN, and myself on the afternoon of September 7, 2011. Sanders was at the Angelina River Bottom Fire Command Center that was established in the small town of Douglass, Texas. I was located in a small church in the Lilbert community that was acting as a supply point for the firefighters. Douglass is just three miles north of where the Piney Woods of East Texas was ablaze. Earlier that day, the Nacogdoches County Sheriff's Office had contacted Kent Tannery, KD5SHM, and asked if the Nacogdoches Amateur Radio Club could provide communications assistance to the firefighters. Tannery then called the Nacogdoches County Emergency Management Planning Section Chief, Tara Triana, to find out what was needed and where. Tannery said, "They told me they wanted three hams at the three places (Douglass, Lilbert, and Sacul), but then Tara told me they needed help monitoring the three different fire locations that were using the Texas Fire frequencies and relay for them." The State of Texas has an Interoperability Channel Plan that allows multiple agencies to communicate with each other. In the case of Texas Fire1, Texas Fire2, and Texas Fire3, these are all VHF simplex frequencies. The density of the forest, as well as the distance between outposts, were barriers for firefighters' communication with each other or the command post, with their VHF hand-helds in simplex mode. Tannery continued, "Then I knew what to take and what we needed to do and looked up those frequencies and e-mailed them to Army Curtis, AE5P." Curtis immediately activated an emergency net on the club's 147.32 MHz repeater and coordinated activating Rusty Sanders, KD5GEN, to man the Command Center; Kent Tannery, KD5SHM, to operate from Sacul; and myself, KE5EXX, to operate from Lilbert. We ended up using two ICOM IC-2720 units and a Yaesu FT-1500 to communicate between the three remote locations and act as relays to the different fire departments who could not communicate over the large forest. The Sheriff's Office supplied each of us with portable radios. We also provided health and welfare traffic, such as confirming that assets were moved to the correct location or that food and drinks were provided to the firefighters. 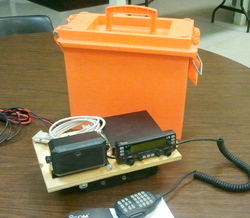 "Orange Box" Ready to Go Kit. As soon as I arrived on location, I checked in with the point of contact and told her why I was there. I looked for the best place to setup, preferably someplace quiet and out of the way. I originally attempted to use a 5/8's wave mag mount on a cookie sheet from the inside of the building, but I was unable to make the repeater. In order for me to get on the air, I put the mag mount on the roof of the metal building I was in and ran the coax in through a window. We learned quite a bit from this event. Although all of us were activated during the Space Shuttle Columbia disaster and numerous hurricanes that have hit our area, this was new territory for many of us. Until now, we had not operated from such remote areas. We found that we needed to add more coax to our go kits. We also found that we needed more of the mast/tripod/antenna kits that were later donated to us. Muskegon, Michigan - Hundreds of Amateur Radio operators across the country will be displaying their emergency communication capabilities on Saturday, January 28, 2012. The public is invited to step out and view what Amateur Radio communications can do in times of emergencies. The Society for the Preservation of Amateur Radio (SPAR) established a Winter Field Day event in 2007 and invited Amateur Radio operators to participate. Using emergency power, operators will construct, and operate portable emergency stations in parks, shopping malls, schools, and backyards across the country. Operators will demonstrate long and short range voice, data, and Morse code communications. The Muskegon County (Michigan) Emergency Communication Services, Inc. a local non-profit amateur radio group involved in emergency communications, has awarded Barbara Grob, K9BLG, the Al Ronning Outstanding Service Award. The award is given each December to a member of the group that has gone above and beyond the call of duty in service to this organization. This recognition is given in memory of Al Ronning, K8AER, who was an inspiration to other members of the group in his tireless effort in public service. Ronning was a member of the group who died in an automobile crash in December, 2006. James Duram, K8COP, Emergency Coordinator, Muskegon County, awarded the plaque to Grob at their December meeting. In the recent ARES E-Letter there was the statement "This COML training will qualify emergency responders to lead ICS communications units if they possess the necessary prerequisites, including knowledge of the following: local communications; communications systems; and regional, State, and local communications plans." To be more correct, the training alone doesn't "qualify" emergency responders by itself after one takes the COML Training (and I have). The most important part of the process to achieve COML qualification is completion of a task book that the student receives. This document gets signed off on each of the tasks by served agency staff in authority to see first hand that the student demonstrates the capabilities of the position. This task book must be signed off when the student demonstrates experience in real world events or exercises. Then, the task book must be submitted to a State Level organization that has the responsibility for certifying the student before they can say anything other than they attended the course. The COML qualification is not awarded until those additional steps take place. Merely taking the course is not sufficient. I should note that the Department of Homeland Security Office of Emergency Communications (DHS - OES) is also running other courses that would be useful to radio amateurs: COMT and RADO, all being important and specific roles in the NIMS/ICS framework. Here in North Carolina we (ARES and MARS) have a strong effort to support the agencies we serve - and I'm sure the effort is equally as strong in other states. That being said, I can say with some confidence that a good number of COMLs in North Carolina who have had their task books submitted for approval are hams! The DHS OEC staff just last week came to North Carolina for our second State Communications Interoperability Summit. There were many hams in attendance, and among the many events and training opportunities, with Amateur Radio having a major role in this Summit, there was a two day exercise for COML students from previous COML courses and a small number of students demonstrated all the task book capabilities to multiple COML qualified evaluators so that some or all of their COML tasks could be signed off by DHS and State qualified evaluators for submission to our State Interoperability Executive Committee, which certifies COMLs here. The United States Adventure Race Association (USARA) National Championship Extreme Racing event was held October 7 to 8, 2011 in McCreary County, Kentucky. It is a cross country extreme Ironman event consisting of three person coed teams from across the United States, involving hiking, biking, canoeing, and orienteering. The event was coordinated at Cumberland Falls State Park, with the race starting at Blue Heron in the Big South Fork National River and Recreation Area at 8:00 AM on Friday. The first team finished exactly 20 hours and 15 minutes later in the early morning hours of Saturday. Communications was provided by Region 5 ARES from McCreary, Pulaski, and Whitley counties, Kentucky. Operators were positioned at six Transition Areas, and reported arrivals and departures of each team at each Areas. Many legs were involved, starting with a short hike from the start point before the teams transitioned to mountain bikes. An orienteering course tested the teams' map and compass ability. At Bell Farm the teams started a time trial event called "The King of the Mountain," which tested the teams' endurance for a climb to the top of Peter's Mountain Lookout Tower. More biking was followed by the teams transitioning to canoes to paddle a distance of 5.7 miles, with another orienteering course at the end of the paddle. More paddling and biking was followed by more orienteering courses. Total distance was 78.2 miles through some of the most beautiful country in the eastern United States. ARES operators performed with excellence, totaling 23 hours of continuous operation. The repeater used was the 444.050 MHz machine, Williamsburg, Kentucky, owned and maintained by Will Jones, KB4PTJ, which offered outstanding coverage including hand-held coverage in most places along the river gorge. The challenge was the size of the course and the number of operators who were able to volunteer their time and resources to such a major task. I was forced to ask several operators to move from one Transition Point to another to provide information as the contestants checked in and out. I have had a difficult time recruiting enough ARES members and that was the main reason for some lack of coverage. The ARES net control station (NCS) was established in a room at DuPont Lodge and sent information upstairs to race officials who in turn posted it on the USARA website. Due to limited access of an entry point for our coax and antenna location we were forced to be in a separate room from the race officials. This problem was overcome by the NCS operators' adaptability, relaying reports from the field by texting and sending e-mails to race officials. But, the bottom line is the NCS operation and the USARA bloggers should have been co-located. Another issue was lack of food for the communications personnel at each Transition Point. Since all operators were informed to bring their own food should none be available, it was not a problem. The lesson is: When deployed on any type of public service event or an actual emergency, an ARES member should be self sustaining, and not rely on being provided with this type of support. The participation by ARES members from different Kentucky districts was great. Operators fell into place without any problems. NCS was up and running before the race start and was well staffed with four operators and several radios to cover the primary as well as the secondary frequency. Net Control operators were members of the Lake Cumberland ARA, due to their duty-specific training by Don Munsey, AC4DM, Pulaski County, and performed flawlessly. Flagler County ARES and The Flagler Palm Coast Amateur Radio Club hosted the ARRL Kid's Day event this past Sunday in Palm Coast. Participants included Boy Scout Troop 402 who were working on Radio merit badges and youth from all over the county. The objective was to get youth on the air and get them interested in Amateur Radio by passing basic traffic over HF and other modes. Children were able to log their traffic and see what it was like to work stations near and far. Both groups are working to garner youth's interests and advancing their education to the point of obtaining their licenses. FPCARC runs a cadet program year round educating students on various aspects of Amateur Radio and both organizations hope to run similar events during the year.